The computer program WTAQ simulates axial-symmetric flow to a well pumping from a confined or unconfined (water-table) aquifer. WTAQ calculates dimensionless or dimensional drawdowns that can be used with measured drawdown data from aquifer tests to estimate aquifer hydraulic properties. 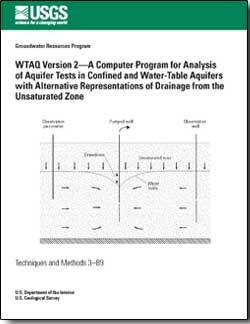 Version 2 of the program, which is described in this report, provides an alternative analytical representation of drainage to water-table aquifers from the unsaturated zone than that which was available in the initial versions of the code. The revised drainage model explicitly accounts for hydraulic characteristics of the unsaturated zone, specifically, the moisture retention and relative hydraulic conductivity of the soil. The revised program also retains the original conceptualizations of drainage from the unsaturated zone that were available with version 1 of the program to provide alternative approaches to simulate the drainage process. Version 2 of the program includes all other simulation capabilities of the first versions, including partial penetration of the pumped well and of observation wells and piezometers, well-bore storage and skin effects at the pumped well, and delayed drawdown response of observation wells and piezometers. Barlow, P.M., and Moench, A.F., 2011, WTAQ version 2—A computer program for analysis of aquifer tests in confined and water-table aquifers with alternative representations of drainage from the unsaturated zone: U.S. Geological Survey Techniques and Methods 3-B9, 41 p.